This is such a book, first released one year ago in October 2012 and reissued now just when it seems a thawing of 33 years of enmity has begun between the United States and the Islamic Republic of Iran. This last chance at peace was anticipated in its pages. Will the birth of hope for that peace dissolve at last its lurking shadow of horror: a war foreseen in the utterances of prophets too horrible to fulfill? John Hogue, defines himself as a "Rogue" Scholar. He is a world renowned authority on Nostradamus and other prophetic traditions. His work is critically acclaimed for cutting through the social, religious, and nationalistic projections of prophets and their interpreters to find threads of insight they all share. Futurist, accurate forecaster in his own right, creator of what some people call the Huffington Post of prophecy websites, HogueProphecy.com, Hogue has received wide international recognition appearing on over 100 television and 1,000 blog and talk radio shows on five continents: North and South America, Asia, Australia and Europe. At present, he has the most multimedia exposure of any prophecy scholar in history. Hogue has published 23 books in 19 languages. He currently lives on an island in the Pacific Northwest. I have the PDF version of this book and found it to be very detailed and informative; it helped my understanding of the different Middle Eastern players, a subject that almost demands its own score card, especially for Western Readers. I am really looking forward to the new Kindle version update because John is always very careful to update, change or even shred his previous speculations when the facts warrant it and/or to explain how things may be appearing one way on the surface but actually playing out very differently behind the scenes. This is one of John's more complex books, because Middle Eastern Politics and Nostradamus are both tricky and complex subjects. I found the best way to read it was in chunks, followed by some hot tea and time to digest them; them off to read more chunks. I usually read books all the way through at once, but this one has so much information I think the slower method works better. Rated five stars and all well deserved! John Hogue is an interesting and entertaining writer. I read his prophecies and check them out. He is a visionary. He is accurate. He also understands how the stars, Zodiac and solar system affect us or even, run us and control us. He knows what happens in the Middle East is of great importance to everyone on the planet. I look forward to his next book of prophecy. John Hogue has a way with words that keeps you interested and, in my case, expands my perception of the events happening around us. His vast knowledge and discernment concerning history and astrology blended with his sharp intuition makes this book and his other writings very special. 3.0 out of 5 starsGood political commentary, but in some ways confusing. 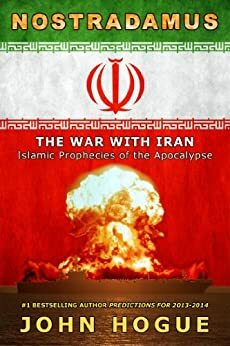 This book is a good political commentary on American relations with Iran and the Middle East in general and its intuitive extrapolations as to what could happen are pretty much on the mark. Prophesy may not be the important part here as Hogue's political intuition seems more important. Also, the book keeps switching around to different subjects, some personal and other matters which can confuse the reader. But I would recommend reading this book to anyone concerned about current events and their direction. I like anything written by John Hogue and follow him on facebook and coast to coast radio. Not earth shaking, lol, but another good observation from our dear John, no pun intended.